The Holiday Party will be available on Club Penguin as early as Thursday (Dec. 20) at 12:00 AM EST. 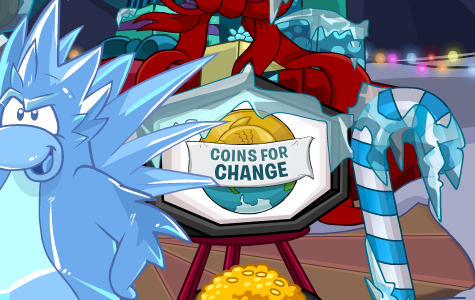 If you are passionate about making the world safe and would like to lend a flipper, be sure to check out the Coins for Change event on the Island. You will even be able to donate to a specific cause using the coins you upload using the CP Coins Money Maker. In the meantime, are you excited for the upcoming Holiday Party and Coins for Change? I missed out on last year’s event, so I’m excited for this year’s event! This entry was posted in Announcements on December 17, 2012 by admin.